Below are specific testimonials from some of the participants. If you would like to leave a testimonial, please submit through our Contact page on Pulmonica.com. Before I leave the house in the morning, I usually play the Pulmonica for five minutes, staying on the low notes. It’s a form of meditation. In the middle of the afternoon I usually play it for about 20 minutes, again as a form of meditation while I’m waiting for the bus. And then in the evening, I find it calms me down and I play while watching TV, maybe 20 minutes, maybe an hour or more. I’ve dabbled with playing songs on it, but haven’t gotten very far yet. Once I woke up and quit smoking, I was doing the outward things, exercises, like walking, kayaking, etc., but my lungs weren’t getting any better. Then winter came and I was feeling really bad. The Pulmonica program gave me hope. What it did for me was make me feel like I was doing something about my recovery and I know it works. It makes sense to me. I feel an improvement. I didn’t feel like a lot of stage 3 COPD patients, and I’m hoping there might be a reversal. Usually in the morning I would be coughing -- I would be coughing right now. I’ve noticed that there’s no fluid levels like there used to be, I hardly have any phlegm in my lungs at all. I used to fill buckets full of that stuff. In fact, I made a joke about to the doctor when he handed me a small cup and I didn’t have enough to show him. Sometimes after I play the Pulmonica, I cough up a little bit, but nothing like it used to be. I don’t have the choking I used to have. I live on the second floor and I don’t have any problem walking up the stairs now. I walk a mile and a half to work and all over town. When I used to walk down to the corner store, I would have to stop four or five times to rest. Now I don’t have to stop at all, and I look back and laugh, and that makes me feel good. Pulmonica taught me breathing exercises. I used to think yoga and that Eastern stuff was a little far-fetched and wasn’t for me, but in reality the breathing makes sense to me and I’ll do it. Once I got into the routine, even if I didn’t have the Pulmonica with me, I found I was doing the same kind of breathing exercises, so it taught me that. I think the deep belly breathing strengthens my damaged lungs, both with the Pulmonica and with deep breathing exercises when I don’t have the Pulmonica with me. Most people, when they get COPD, they figure there’s nothing they can do, what’s the use of trying? But they have to help themselves, and the Pulmonica can help with that. I encourage everyone to give it a try. I still use Advair twice a day, but they lowered the dosage from 500 to 250. The other medication I primarily use the Albuterol/Combivent combination. I use it in the morning because that’s the worst time for me. However, by noon, I forget that I even have it, so my usage has gone way down. I used to use it six or seven times a day. I even feel like it helps clear my nasal passages. It opens up and releases any phlegm and allows better breathing. I’m just so glad that the doctor found this Pulmonica. I was having a lot of trouble breathing, and I couldn’t cough anything up. Now with the Pulmonica, using it at the longer intervals (up to 90 minutes at a time), I’m able to bring stuff up and I’m breathing better, able to walk a little bit further, and I started to do housework for the first time in six months. I’ve been playing while driving, and it is wonderful. I used to get dizzy from playing the Pulmonica, but once I learned how to deep breathe, the dizziness went away. I wasn’t breathing right, I never knew that. My nebulizer use is down to three times a day from four, and I’m going to try to cut back to two. My rescue inhaler is down to three times a day versus eight. My lungs are pretty clear now, and I’m not bringing much up anymore. My energy level is way higher, I haven’t taken a nap in about five weeks. I feel like a different woman. This pulmonary rehabilitation program has changed my life. I didn’t want to live before. I used to pray every day that I wouldn’t wake up, now I pray every day that I will wake up so I can see my grandbabies another day. The low notes on the Pulmonica are hard, so I start with the higher notes and work my way down. When I get down on the low notes, I start to get hoarse, so I stay about the middle. Even so, there’s a big difference between the Pulmonica and the regular harmonica we received. 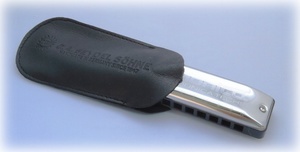 You have to do the deep breathing with the Pulmonica, but you don’t with the regular harmonica. Pulmonicas are like meditation. I feel like I’m going to a safe place. I’m less depressed. I love the Pulmonica. I started using it about eight weeks ago, and before then I was having trouble breathing, walking, and swimming. I had stopped doing a lot of the things I enjoyed, but now since the Pulmonica, which I use for about four or five hours a day, it’s helped me a lot. I can walk, ride my bike, swim, and my medication has gone down. I was using the nebulizer four or five times a day, and my inhaler three or four times a day. But now, I haven’t used the nebulizer in three or four weeks, and I use the inhaler much less. I’m a chaplain at the jail and I use it as I walk around. The guys ask me if I can play a song, and I say no, but I can play a note. I use it as I’m driving, or when I’m on a break from work. I sing in a choir and once in a while I take the Pulmonica out and play it during a song. My singing has improved a lot. Learning to belly breathe was really important. I had been taught how to do it before, but I didn’t know if I was doing it right. Using the Pulmonica, I can tell that I’m breathing deeply. The more I play, the better I feel. I’ve also been sleeping much better. Before using the Pulmonica, I used to get up three or four times in the night to take a puff of my inhaler or use the nebulizer. For the last three or four weeks, I’ve been sleeping straight through the night. I hate the albuterol because it makes me jittery and nervous, and now I feel more relaxed all the time. I feel more rested and I have more energy. Before I would think three or four times before I would do something, now I’m on the go and it doesn’t bother me. My lungs feel much clearer, and if I do have to spit, it’s clean. It used to be greenish. I used to be sick all the time, and since I started the Pulmonica I’ve only been sick once, and that was a high pollen day. I’m calmer and more peaceful. I think because I’m not worried about not being able to breathe. I was getting bad asthma attacks and I was tense all the time. It’s like a meditation. I’m happier because I can do more things. People used to ask me go to the beach and I would say no, because I knew I’d be tired, and I was afraid I might have an asthma attack. Now I’ve been to the beach three times in the last few weeks. The Pulmonica has changed my life. I have a big trip planned and I feel much better knowing that I’m feeling better. Anyone who wants to get rid of their breathing problems should be using the Pulmonica. People ask me about it because it doesn’t sound the same as a regular harmonica, and I tell them it’s a Pulmonica. It’s surprising that it would be as effective as it is. I saw results in just a few days. You have to use it, but it helps. I sing with a group, and this winter has been tough because I’ve had two bouts of upper respiratory illness. I’m a soprano and I have trouble holding those high notes, so I have found that I been blowing the Pulmonica for about 10 minutes before rehearsal, and it makes feel clearer and more alert, and I can hold the notes longer and I can hit those higher notes. I think I’m breathing better with it. When I use it, I’m better. I carry it in my pocketbook, and I will keep it there. I’ve always had trouble in conversations because I get breathless. From the asthma I had as a kid, I have some restricted lung capacity. When I answer the phone most people tell me I sound out of breath. I don’t think I’m as breathless when I use the Pulmonica, I think that it helped. I have problems with fatigue and anything that wakes me up is a plus in my mind. If you breathe better and feel more alert, that has to make you feel better overall. I would probably find it a lot more helpful if I used it more, but that’s life. I think you have a good product here. They say, first, do no harm, and the Pulmonica definitely doesn’t harm anyone, in fact I think it helps a lot. I think it oxygenates you. Breathing is easier, more free. The Pulmonica relaxes me. I have more energy and feel like I am able to do more. I have less congestion. My life seems more manageable. I was getting depressed, feeling old. No longer feel that way. The Pulmonica is fun, and I know it’s good for me. The Pulmonica has taught me deep breathing. I’m more likely to move around and breathing is easier. Before I started playing the Pulmonica, I had a hard time coughing up sputum, but since then it has become much easier. It’s helped me to concentrate on my breathing, more so belly breathing. Because of the deeper breathing, I have much more oxygen, which makes me feel energized. I have a much easier time clearing my lungs out, after play. Playing makes me meditate while I’m playing. I feel calmer and more peaceful. I feel much more energized and now that I’m working again, I feel much happier. I honestly believe that the Pulmonica program is a great thing for people with COPD. It has truly helped me, and my medication has gone down since then. Thank you. The more I blow into the Pulmonica, it increases my breath, that enables me to inhale better. My feeling better makes me breathe better. I sleep better at times. Sometimes I don’t sleep well, anyway. Little by little, my energy is increasing. It makes my lungs clear, which increases my breathing. It makes me calmer because it increases breathing, energy, and sleep. It was hard getting started, but playing the Pulmonica was most enjoyable by the end. It really helps my breathing. If you would like to leave a testimonial, please submit through our Contact page on Pulmonica.com.